The development of new hybrid energy systems is our specialty. 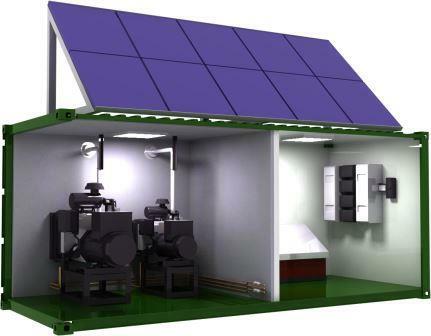 We combine solar photovoltaic, solar thermal, wind, generator, biomass, micro hydroelectricity and cogeneration. In most cases, these systems are installed in a container or building custom built, and are delivered turnkey. We perform remote monitoring of your system and can even diagnose an event from our offices no matter where it is located in the world. We can also add cogeneration to this system to recover lost heat from the internal combustion engine of low and medium power generators. The heat can then be used to provide additional energy to heat a building, for example. Thus, we can obtain more than 85% efficiency from a single energy source.